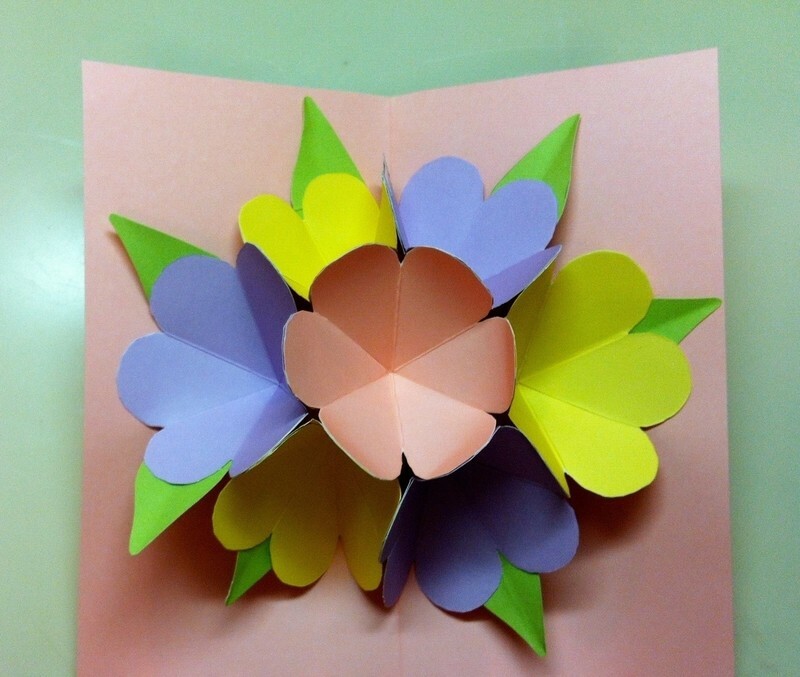 I've seen this card on a lot of different sites and figured I'd share it one here, with my own tutorial. 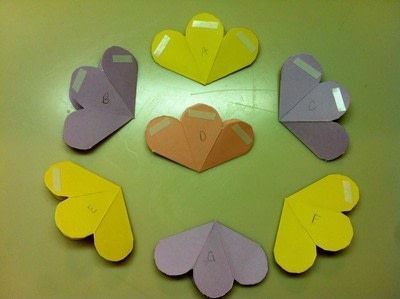 You can also make a little template that looks like this one in the picture, just to help make all your flowers come out the same. 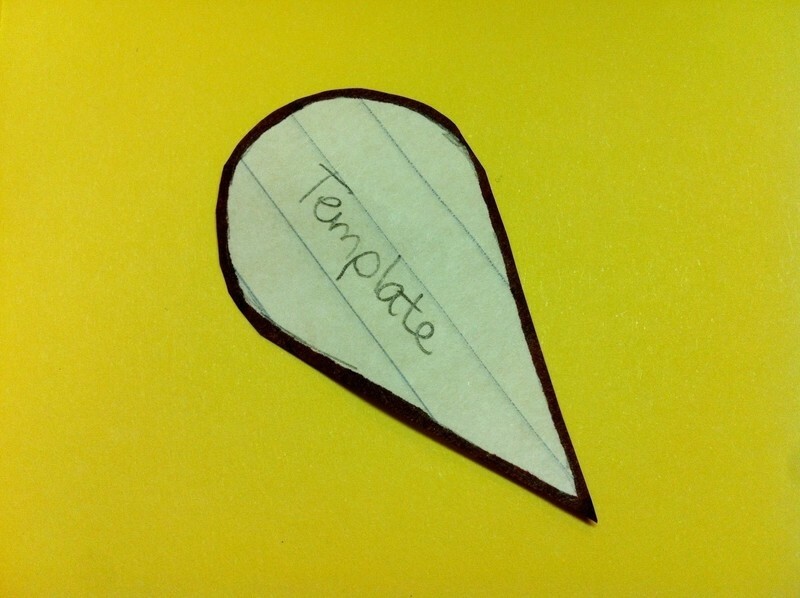 It's 2 inches long, so cut out a little 2x2 inch square, fold it in half on the diagonal and cut it out like you would a heart. Then open it up (now you have a heart) cut it in half so you have one raindrop shape. Use that trace out your flowers in the next step. 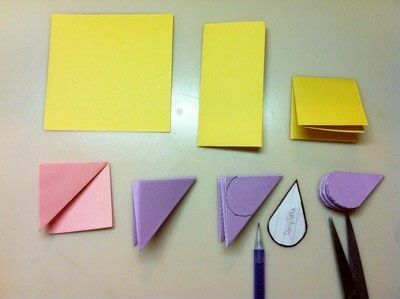 Take one of your 4x4 inch squares and fold it in half, then in half again. 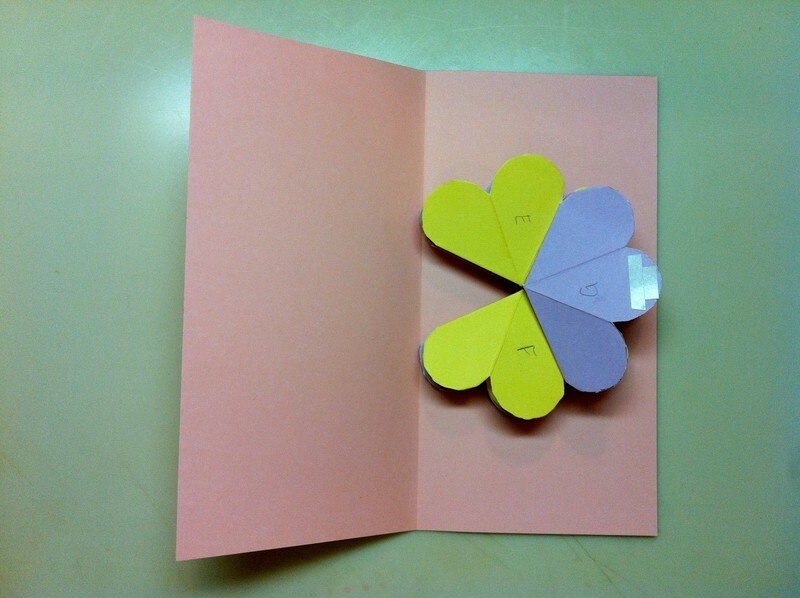 Then take one corner and fold it over on the diagonal, the flip the square over, and fold the other corner up the same way. Now use your template to trace the petal shape onto your folded square. Make sure you put the point of the petal on the center of the folds. Cut out your petal shape. 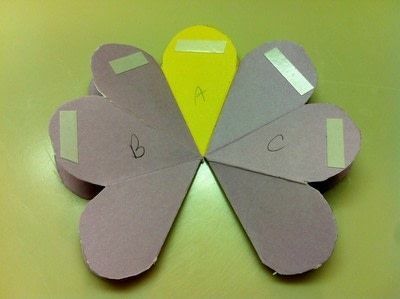 Unfold the 1st one to make sure you did it correctly, lol. I goofed up my 1st few! 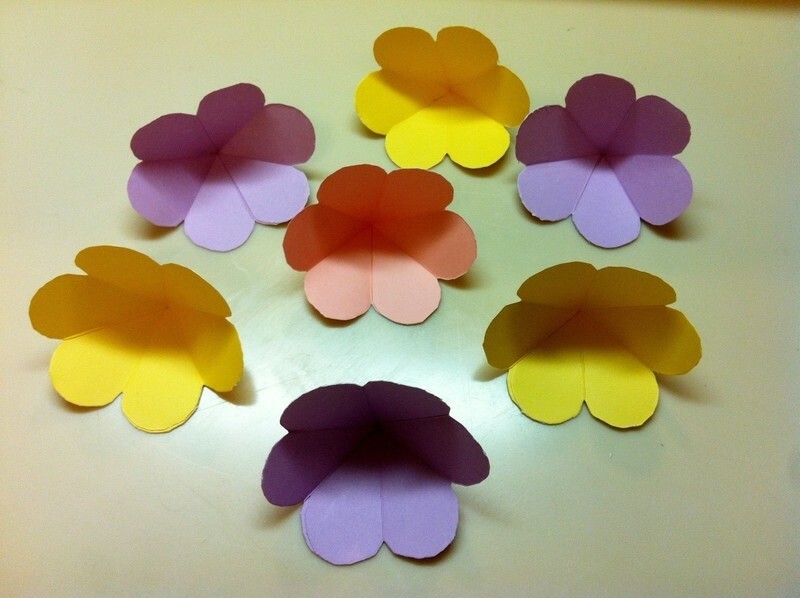 Cut one individual petal out of each flower. 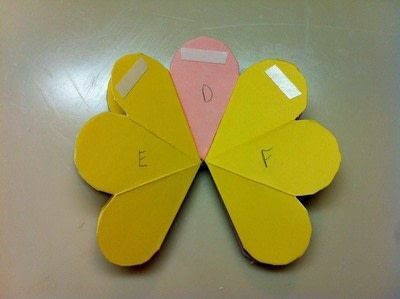 Use your glue stick and put glue on one petal, the overlap the the adjacent petal. 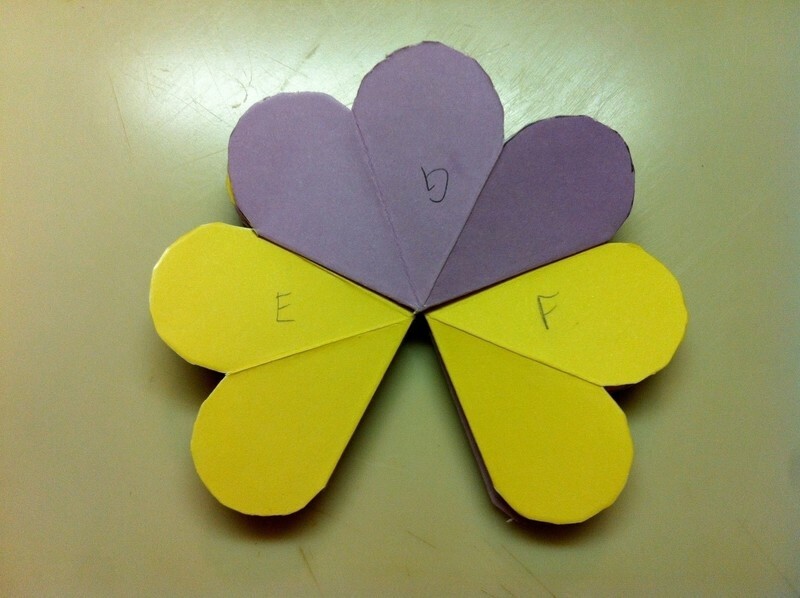 So your flowers come together and for a full circle. Lay out your flowers in the way you want the colors to go. 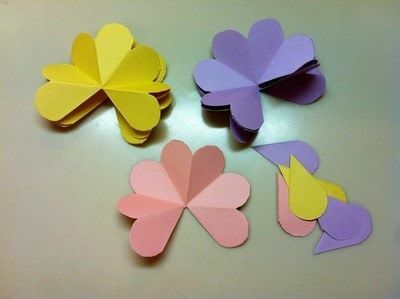 I cut 1 Pink, 3 Yellow and 3 Purple. So I put my pink in the middle and then the other two colors alternating around it. Remove the top paper from the tape on the outer petals of A. Then lay B and C on top, lining up the petals, as pictured. Now remove the top paper from the tape on the three petals on the top. One from B, the last one of A, and one from C. Place flower D on top. 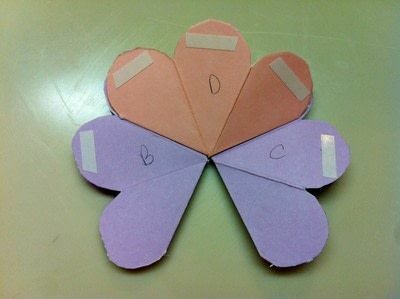 Remove the top paper from the tape on the last petal of B, both outer petals on D, and last one of C.
Then place flowers E and F on top, covering B and C, as pictured. Remove the paper from the tape on all remaining petals and place flower G on top of E, D, and F.
Take your 8x8 inch paper, and fold in half. So it's tall and skinny. Place doubled sided tape on the middle petals of flowers G and A. Place your stack of flowers inside the card, right in the crease. Close the card and press down making sure all the tape is secure. Now you can go back in and add leaves if you want. Just make sure you don't place any on the center crease of the card. Or that they are so long they stick out the sides when closed. 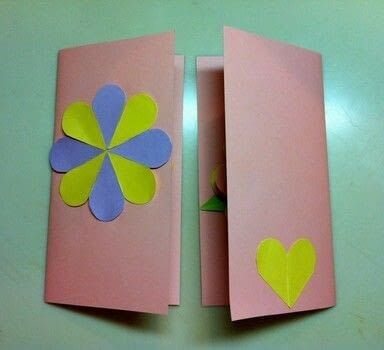 You can also use some of the petals you cute from the flowers in the beginning to decorate the front and back of the card. SO cool!! Ima do it for mother's day! oh i saw this on martha stewart's website!